Location: Situated in a churchyard off the E side of Church Road in the NE part of Buckley. The first church on the site was a chapel of ease built in 1821 by John Oates. It was the only church in Wales to receive aid from the First Parliamentary Grant of the Church Building Commission. 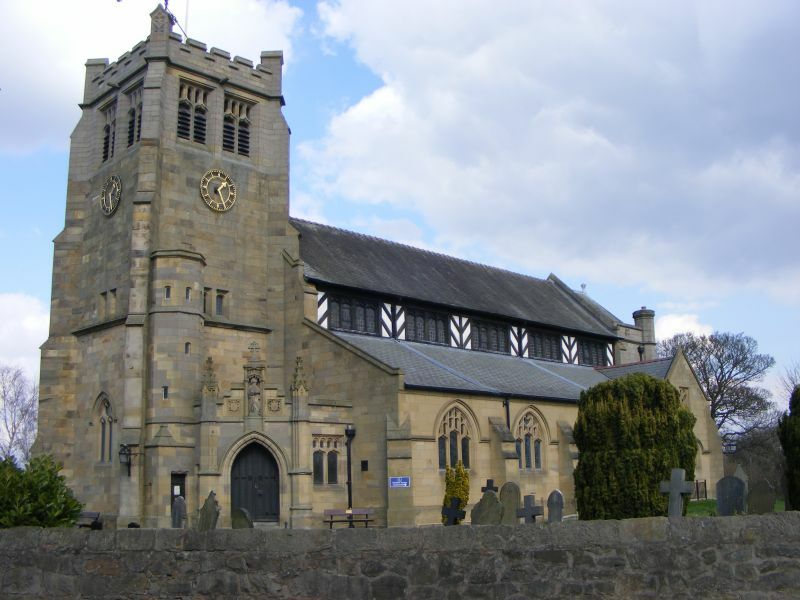 St Matthew's became a parish church in 1874 and it was substantially rebuilt during the period 1897-1905 by Douglas & Minshull, partly at the expense of Mrs Drew, as a memorial to her father, former Prime Minister William Ewart Gladstone who died at Hawarden Castle in 1898. Mrs Drew was the wife of the Rev Harry Drew, vicar of St. Matthews from 1897-1905. Vestries were added first, then the chancel in 1900-1 and in 1902 the tower was remodelled and a baptistry formed as a memorial to Catherine Gladstone, wife of W E Gladstone who died at Hawarden in 1900. Mrs Drew paid for this and for the SW porch which was constructed in 1902 in memory of John Ruskin. The nave was reconstructed in 1904-5. Nave furnishings were replaced, probably late C20. Neo-Perpendicular style with Arts & Crafts elements. Ashlar with Westmorland slate roof with red ridge-tiles, and distinctive timber framing. W tower, aisles, SW porch in the angle of the tower and S aisle, Polygonal apse. The tower is battlemented with stepped angle buttresses, paired louvred bell-openings with flat traceried heads, paired stair windows and an octagonal stair tower rising part-way at the SW corner. The SW porch has a stepped parapet and an arched entrance with a niche with a statue of St Matthew above and piers which terminate with crocketted finials on either side. Low aisles with 3-light traceried windows, clerestory with herringbone timber-framed panels alternating with flat-headed 4-light windows. E end has 5-light traceried window, and a gabled vestry is attached to the NE side. 5-bay nave arcade of steel girders encased in timber and a false hammerbeam timber roof. The walls are of exposed ashlar except for the infill of the timber-framed triforium where there is painted decoration of 1910 restored in 1963. This is in the form of a row of panels in which stencilled motifs flank painted figures bearing shields. Canted beams above the arcades are painted with the Beatitudes. The W end baptistry also has an elaborate stencilled and painted scheme designed by Douglas and executed by W F Lodge on 1903. This consists of stencilled IHS motifs with crowns, a frieze at the level of the top of the window, and above this roundels with painted figures representing the Virtues. The window which is by Henry Holiday was given by Mrs Alice Wickham, daughter of W E Gladstone. There is a panelled octagonal red sandstone font on a plinth with an ornate oak cover by Herbert Read of Exeter. There are steps up to the chancel and to the sanctuary, where there is a beaten copper Arts & Crafts style reredos. Chancel furnishings by Douglas are of oak with flowing free Perpendicular style carved decoration. An organ by Bishop & Son of 1905 is situated to the S of the chancel. There is a good ensemble of glass by Henry Holiday including the 5-light E window which has a crucifixion scene. Other glass includes windows by C F Whitcombe and T M Cox. Listed grade II* as an outstanding example of the work of John Douglas which is the latest and amongst the most significant examples of his use of timber-framing in church design. Group value with the Lych Gate. Situated in a churchyard off the S side of Mold Road in Bistre.